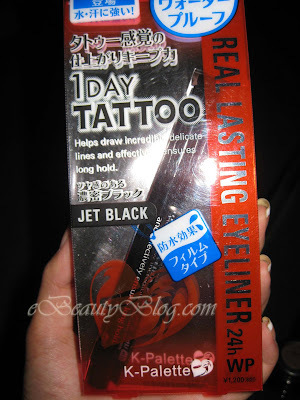 Apparently, this is Japan's top selling eyeliner. The description on the back claimed that: This quick-drying liquid eyeliner has a special brush tip and high water resistant polymers, giving you superb control for creating remarkable smudge-resistant effects. The result: eyes become more defined and focused. It is a film type eyeliner. The water resistant coat polymer keeps fine eyelines 24 hours. You'll feel like "1 Day Tatoo!" Also, gentle for your eyelashes; containing camomile extracts and panthenol. The pointy brush tip makes it so easy to apply the eyeliner. You can easily create a nice thin line or build a thick nice line for a more defined look. Overall, I'm impressed with this eyeliner. Leave it up to the Japanese to think of great inventions!! I applied this in the morning and by evening time, it's still very much the same without any touch-up. It's great for those who are going for the doll-eye or cat eye look. It will make your eye pop and stand out. And even look rounder and bigger in a sense. It's also great for those who have trouble lining your eyes perfectly. The design is very much similar to a pen. So imagine holding a pen (with very tight bristles) in your hand and drawing. It's much easier than regular eyeliner with soft bristles. Overall, I love it. Will definitely repurchase. Thanks Kimberly for this great recomendation! I've never bought anything from those websites so please do your own research before buying. 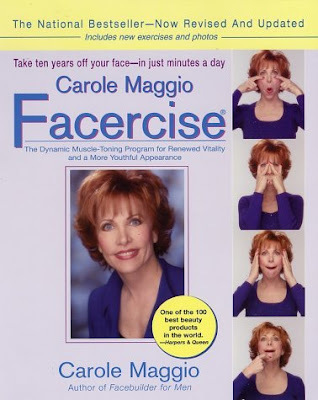 I'm currently doing Face Exercise from Carole Maggio's book, Facercise. Will let you know if it works/not. LOL. twin, your eyes look so pretty!!!! I got convinced by you too!!!! and your lips are ohhh lala!!!!! Love your cute pink shirt! You line your eyes so well! I love the almond shape at the outer corners! I'm definitely going to put this on my list! hahah thank you. I do need to find me a man haha. woooooooooohoooOoooo I enabled you and you LOVE it!!! raWr. they actually have videos on youtube too of those facial exercises, some Korean ones -- I found them last night looking for bb cream reviews... VERY COOL stuff!! Woooooo you're enabling me now! I love this chain of enabling! xDD The liner really looks great!! LOL @ the facercise... But that woman looks like she got botox on her cover picture... ? grrr i want one! im scared to order from that last website, but geez 30 buks? idk,,,luky you!! This is the first website that I've been to where I've looked at most of the tutorials and couldn't get enough!! Amazing tutorials, girl! And you're beautiful!! :) keep up the good work.